​In the "Wild West" of Australia lies an island off the beautiful white sandy beaches of Perth city, which is possibly the remotest city in the world, lying between a great desert to the west, another massive hellishly hot desert to the north, the freezing great southern ocean to the south and the vast Indian Ocean to the west. This island is called Rottnest, which can undoubtedly lay comfortable claim to having the cutest, most adorable animal on the planet - particularly after a recent selfie photo by a cyclist which made international headlines last week. ​The QQQ factor is a major drawcard for Rottnest Island which has a permanent population of over 100 people, and tourist visitors of over half a million every year. ​It is the only place on the planet where these cute quokkas live. 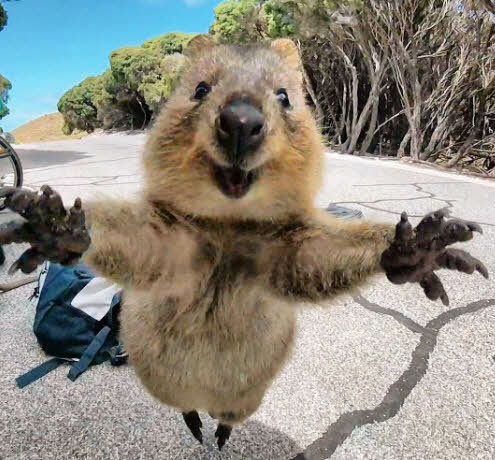 The quokka has evolved over the eons to look like a mix between a kangaroo, koala bear and wombat with the personality of a Hollywood movie star. The people of Western Australia also have a similar flamboyant wild west personality! Map above: Rottnest Island sits off the large metropolis of Perth City, The City of Lights. Photo below: Some of the accommodation on Rottnest Island with a typical sparkling white sand beach.